Ren, and Kenneth Branagh as Henry V.
Spoiler Alert: This post mentions a plot twist in The Force Awakens. George Lucas directed Star Wars Episode 4 and produced Episodes 5-6 before making Episodes 1-3, just as Shakespeare wrote the three Henry VI plays and Richard III (which tell a later part of his story) before writing Richard II, the two Henry IV plays, and Henry V (which tell an earlier part). Just as people sometimes call Episodes 4-6 "the first Star Wars movies" because they appeared first, Henry VI-Richard III is called the "first tetralogy" because Shakespeare wrote it first. Richard II-Henry V is called the "second tetralogy" because he wrote it second. The second tetralogy's last play, Henry V, ends with an epilogue linking it to the first tetralogy, creating a single, continuous epic that tells the story of England from the late fourteenth century to the late fifteenth. That story reaches a clear finale in Richard III when Richard, the last Yorkist king, is killed by Richmond, who becomes Henry VII, ending the Wars of the Roses and establishing the Tudor dynasty. Star Wars seemed to have reached a similar finale in Return of the Jedi. Darth Vader died, and the Alliance defeated the Empire, ending the star wars. But now we have The Force Awakens, the beginning of the new trilogy that George Lucas said we would never have. It's as if Shakespeare continued his story with Henry VII and then wrote more plays about the Tudors—or, rather, as if he let someone else write them without having control over his story, which seems to be what happened with The Force Awakens. Shakespeare did co-write one play about a Tudor, Henry VIII, but this play doesn't feel connected to the tetralogies. If we wanted to connect another play to that sequence, Edward III, which has at least a few passages by Shakespeare, is a better—but still not good enough—choice. Henry VIII resembles King John in being a history play not connected to the tetralogies. As a play filled with spectacle and having an episodic structure, it more closely resembles the romances: Pericles, Cymbeline, The Winter's Tale, The Tempest, and the co-written Two Noble Kinsmen. 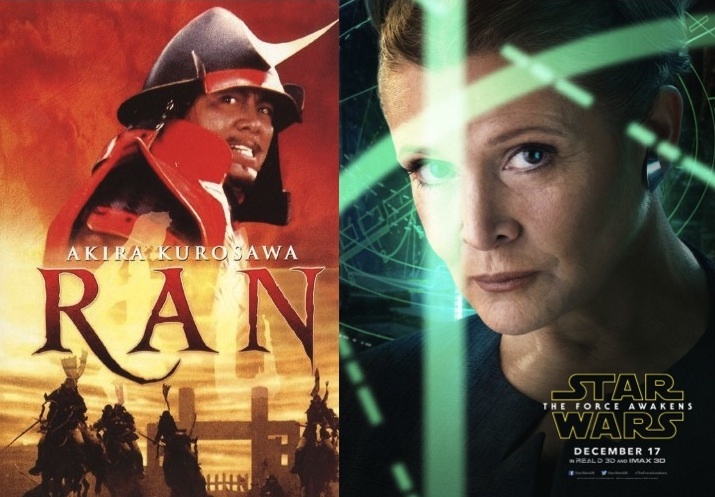 These plays resemble Star Wars movies in being adventure stories with exotic settings. Pericles, for example, takes us from creepy Phoenician Tyre, ruled by a incestuous king, to the fairy-tale-like Pentapolis, to Ephesus, with its mysterious Temple of Diana, much as The Force Awakens takes us from the desert planet Jakku to the ice planet Hoth to Maz Kanata's castle and so on. The romances also have magic that resembles the Force. In The Tempest, Prospero magically controls his servants, drains a young man's strength, and freezes his enemies in place, powers reminiscent of Jedi mind tricks like Rey getting a stormtrooper (who has Daniel Craig's voice) to undo her bonds and leave the door open. Like Prospero, Rey uses a magical force to control people and carries a staff. But her staff isn't magical—it's a physical weapon—and she's not an old man. As a spirited young woman, she is more like two of Shakespeare's spunky comic heroines: As You Like It's Rosalind and Twelfth Night's Viola. Like Rey, Rosalind and Viola have to make their way in the world without help from a parent. All three hope to be reunited with family members. Rey wants to remain on Jakku in case her parents return, Rosalind seeks her exiled father in the Forest of Arden, and Viola prays that she'll again see her perchance-not-drowned brother. Although Rosalind and Viola are courageous—Rosalind braves thieves and rapists, and Viola lives disguised in an alien country where she knows no one—neither has Rey's physical courage or fighting abilities. Rosalind hides her "woman's fear" beneath a "martial outside," and Viola says, "I am no fighter," and then proves it in her comical duel with Sir Andrew Aguecheck. As a fighting young woman, Rey more closely resembles King Lear's Cordelia, who leads a French army, invading England and battling Edmund's and Albany's armies. Cordelia differs from Rey in that she's a princess who becomes a general, which makes her more like Leia Organa; Rey is a "scavenger" on her way to becoming a Jedi knight. as General Leia Organa in The Force Awakens. Jedi knights are good and Knights of Sith and Ren are nasty, but none are fools, like Sir Andrew Aguecheek, or drunkards, like Sir Toby Belch (Twelfth Night) and Sir John Falstaff (1 and 2 Henry IV and The Merry Wives of Windsor). Knights like these reflect the fact that in Shakespeare's day knighthoods were often bestowed for political reasons. 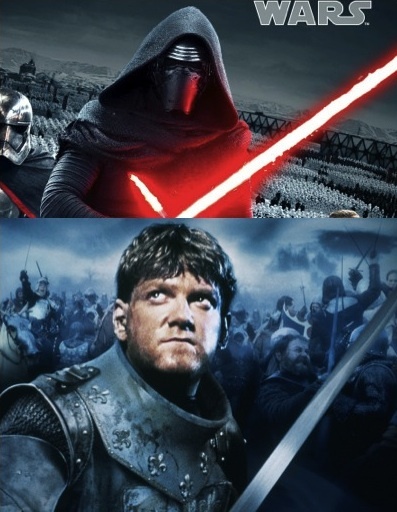 In Star Wars, people—human and non-human—become knights only by training, as Kylo Ren did and Rey seems about to do at the end of The Force Awakens. Is Rey Luke Skywalker's daughter? Is she Han Solo and Leia's? We ask these questions because we know that family is a central theme in Star Wars. The same is true of Shakespeare's history plays. No one has ever portrayed a troubled father-son relationship better than Shakespeare did in the two parts of Henry IV. The Darth Vader – Luke Skywalker father-son story has become part of our shared culture, and now, in The Force Awakens, we have another father-son story with Han and Kylo Ren. Their story is complicated by Kylo Ren's desire to be like his grandfather Darth Vader, a desire that makes him resemble Shakespeare's Henry V. In launching a war on France, Henry models himself on his great grandfather Edward III, just as Kylo Ren models himself on Vader. And just as Henry seems to have inherited his great-grandfather's martial prowess—"This is a stem / Of that victorious stock," says the French king—so Kylo Ren seems to have inherited Vader's dark powers. What do you think? Leave a comment if the Force moves you. At least Shakespeare was smart enough to leave Jar Jar out of Richard II.